The troopers of two starships have joined forces to terminate a massive bug attack at a federation outpost. Before the mission can be completed and the survivors evacuated, one ship abruptly departs and goes inexplicably dark. The remaining battle-hardened troopers race to the rescue, only to discover that the threat from the bugs is about to hit home. With the latest in CGI technology, this film from executive Producer Casper Van Dien ..
Johnny Rico is back! C’mon you apes, you wanna live forever?! I have only one rule. Everybody fights, no one quits. The bugs have breached Mars and the Federation’s Fleet is too far to help. It’s up to us to save the planet. On the bounce, Troopers! The only good bug is a dead bug! Oorah! Casper Van Dien and Dina Meyer return as the voices of Johnny Rico and Dizzy Flores alongside comedian and Starship Troopers superfan DeRay Davis in a..
Own Starship Troopers 2 DVD from Deff, DVD, Blu-Ray & 4K Video Specialists - Free UK Delivery..
Mankind becomes an endangered species in Starship Troopers on Blu-Ray's high definition disc. The director of Total Recall is recruiting You for an urgent, do-or-die mission to save humanity, made all the more thrilling in this mind-blowing new format! The new millennium pits man against an intelligent, deadly race of alien bugs: some thirty feet tall, some that fly and all capable of destroying every living thing on Earth! Marvel at th.. 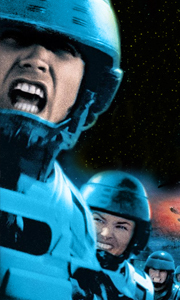 The Federation needs you for a desperate do-or-die mission in Starship Troopers, the ultimate sci-fi action thriller from the director of Total Recall... hailed for its mind-blowing special effects and amazing futuristic settings. The new millenium brings man face to face with the deadliest enemy of all... an intelligent race of alien bugs, some thirty-feet tall, some that fly and all capable of destroying every living thing on Earth. T..
Own Starship Troopers - Traitor Of Mars DVD from Deff, DVD, Blu-Ray & 4K Video Specialists - Free UK Delivery..